A couple weeks ago, I picked up a 10-pound bag of oranges at the Farmer’s Market for $4 – score! 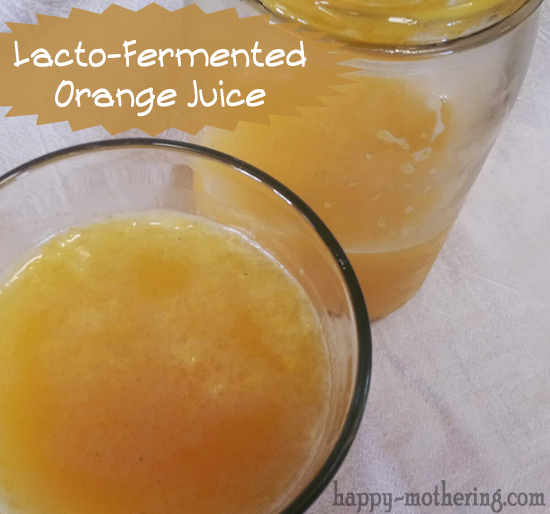 Squeezing orange juice has become one of Zoë’s favorite things to do, so over the weekend we decided to give making lacto-fermented orange juice a try. Not only does the fermentation process add sparkly bubbles, it also adds a healthy dose of probiotics to it! There is a recipe for fermented orange juice in Nourishing Traditions, but after seeing a simpler recipe on Oh Lardy, I decided to make a variation of her recipe. We made one jar with pulp and one jar with the pulp strained out so we could decide which way we prefer it. I ended up preferring the version without pulp (I usually prefer less pulp in my orange juice). I was surprised that the sweet taste of orange juice was gone, which is great because I don’t do well with too much sugar. What I was left with was a bubbling, slightly tart beverage that almost tasted like a mimosa (without the alcohol)! We’ll definitely be making this again. Squeeze your orange juice and add about 3 cups to each mason jar. Add about ½ cup of filtered water and 2-3 tablespoons of prepared culture starter to the orange juice. Screw the lid on the jar tightly then shake the jar a bit to mix thoroughly. Let the jar sit at room temperature for 24-48 hours until it’s bubbly. You may need to burp the jar to prevent too much pressure from building up. If you make this recipe, don’t forget that you can use the leftover peels to make citrus infused vinegar for cleaning! What is your favorite fermented beverage?